This is a transcription of a ledger that is in the possession of the La Plata County Clerk's Office. The spine of the ledger says "Agricultural Statistics - La Plata County." The original ledger may contain information in addition to what was transcribed. To receive an image of the original document via email, please use the submission form on the Home page of this site. Be sure to include your name, email address, the page number, the year of the entry and the name of the person as listed in the transcription. This data is presented in alphabetical order within each year. 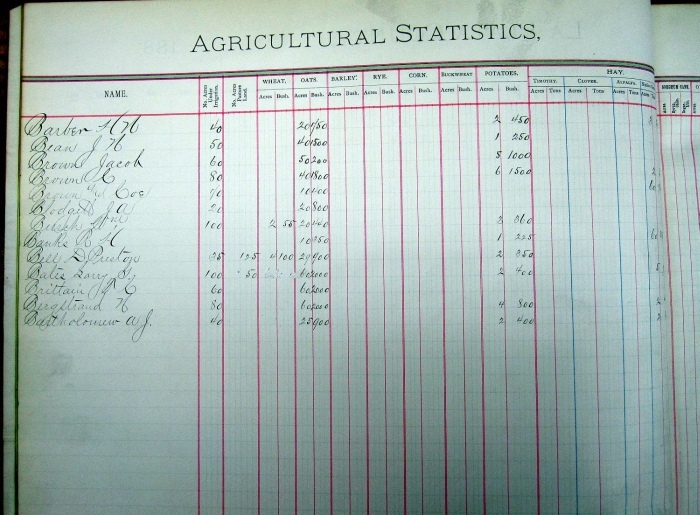 The word 'blank' means that no information was recorded in that column in the ledger. Any name in parentheses below a transcribed name is the correct name spellings according to other local research. Local historical researcher Kathy Szelag has compiled some information on part of the names found in the 1885 Agricultural Statistics. Click on the icon to the right to read this research. Second initial illegible, possibly "I"
First initial might be "T"
First initial could be "T"
Possibly Sandifer. The "I" is not dotted.